Welcome to part five of our series on developing a plugin from scratch. Progress has been nice and steady to date, and by this stage we’ve successfully created a significant portion of our theoretical functionality. In the last installment, we finally got to see the fruits of our labor on-screen in the form of a functioning shortcode. This time around, we’re dipping in and out of both the front and back end. We previously left ourselves a little work to do in terms of organizing the display, and we’ve also yet to look at the settings page that was mentioned way back in part one. We’ll tick off both of those boxes today, and touch on a number of core concepts along the way for you to explore further at your leisure. Let’s start things off by briefly covering the subject of templating. Render HTML in partial template file. All looks fine and dandy above. At this stage, it’s worth pointing out that there’s plenty of room for breaking out your templating into a substantially more modular fashion using this approach. As mentioned previously, a good root around Chris Wilcoxson’s now-hiring plugin on Github will give you access to a fully fleshed-out version to explore. Okay – let’s turn our attention to settings! The vast majority of plugins are going to require some sort of user settings to be useful, and the WordPress Plugin Handbook does an admirably succinct job of laying out the basic options available to us when it comes to creating them. To sum up the general idea, we’ll be using the power of the Settings API to handle a lot of heavy lifting behind the scenes, to create options for our users to potentially choose from, and to add a dedicated place in the admin where they can actually make those choices. As with the previous functionality we’ve added, the first question to tackle is where we should be fitting it all given the structure provided by the WordPress Plugin Boilerplate framework. Let’s look at that now. 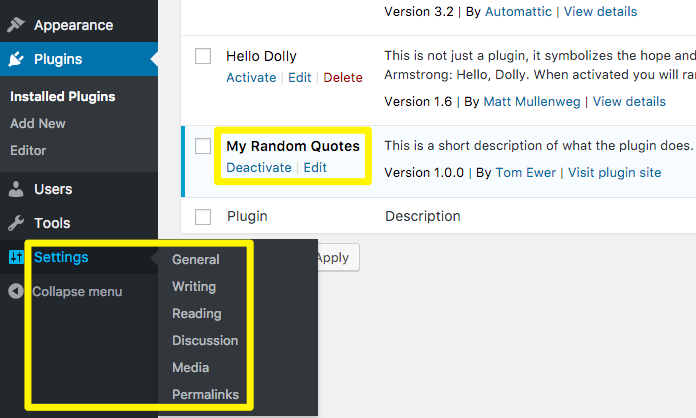 Fortunately, there are a number of handy tutorials out there that step through creating settings options with the WordPress Plugin Boilerplate in considerable detail. For our own purposes, we’ll be keeping things super simple here, but Firdaus Zahari’s SitePoint piece, and Guillaume Kanoffi’s Scotch series, are both well worth a look if you’re following along. We’ll be drawing heavily on the approach taken in the latter below. Add an options page to the Settings menu. Stick a link to that page into our existing plugin admin screen. Actually create the page in the back end. * Add settings action link to the plugins page. * Render the settings page for this plugin. We’re slowly getting there, but clicking on either of those links will still give us a big fat nothing. It’s time to fill in some final blanks. To avoid getting lost in a sea of unnecessary detail, we’re going to keep things very stripped down here. The single option we’ll be making available to our users is a global one to either show a header for our quotes or not – a simple checkbox in other words. Setting up admin settings checkbox option. At this stage, we can actually make a decision and save the changes! Pick up options change in form display. Let’s finish up by making sure that decision is also reflected in the front end. After all, that’s kind of the point of the whole exercise! At this stage of proceedings, we’ve pretty much hit most of the main points we set out to cover. We’ve got a working plugin, an easy way of adding content to it in the back end, display options for deploying it on the site, and the bare bones of some specific plugin settings to tweak further when necessary. All of this is handily contained within the nicely composed structure that the WordPress Plugin Boilerplate provides. Necessity has caused us to skip a fair amount of detail just to cram in what we’ve managed so far. If you were sitting down to create a plugin in earnest, there are a number of crucial areas you’d have to also bear in mind that we’ve blissfully ignored so far. We’ll set out to rectify that in the final installment of the series, where we’ll go on a lightning tour of the major parts of the plugin development process we’ve glossed over. We’ll also give you some advice for further exploration on your own. As always, questions and comments are gratefully received if you’re following along. Get in touch via the comments section below to share your thoughts!